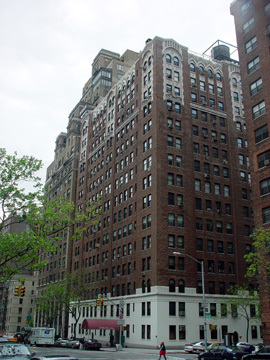 This attractive, 16-story, red-brick building was erected in 1925 and converted to a cooperative in 1983. It has 82 apartments. The building has a very handsome façade with a two-story limestone base and a canopied entrance. It is across the street from the huge and not very attractive Schwab House apartment complex. This building has a doorman and permits protruding air-conditioners. It has consistent fenestration and no sidewalk landscaping and no garage. It has an exposed rooftop watertank andit permits protruding air-conditioners. 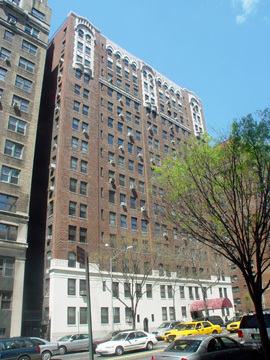 This neighborhood, just north of the very popular Lincoln Center District, is very convenient to public transportation as an express subway station is nearby at Broadway and 72nd Street. 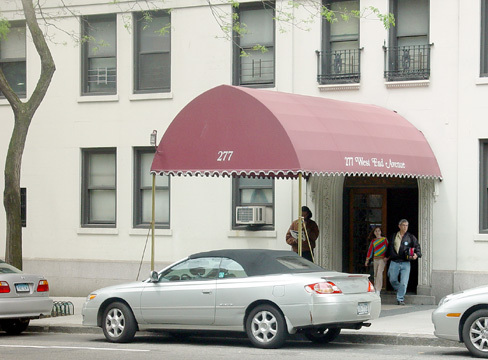 Excellent shopping and many restaurants are nearby and Riverside Park is just a block away. The huge new residential complex developed nearby by Donald Trump and Extell Developmentand known as Riverside South a couple of blocks to the south have added to the neighborhood's retail vitality but have also impacted its congestion.